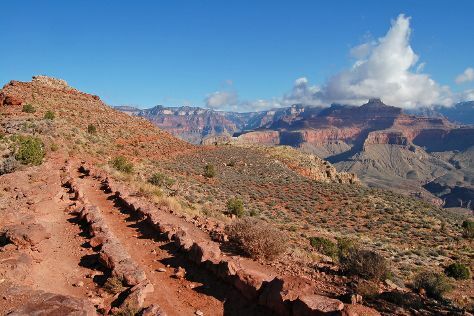 On the 23rd (Tue), hike the day away at Bright Angel Trail. The adventure continues: take in breathtaking views at Grand Canyon South Rim, tour the pleasant surroundings at North Kaibab Trail, trek along Rim Trail, and get great views at Mather Point. For photos, ratings, other places to visit, and more tourist information, read our Grand Canyon National Park day trip site . New York City to Grand Canyon National Park is an approximately 13-hour combination of bus and flight. You can also do a combination of flight and bus; or drive. The time zone difference moving from Eastern Standard Time (EST) to Mountain Standard Time (MST) is minus 2 hours. Traveling from New York City in July, expect much colder with lows of 52°F in Grand Canyon National Park. Finish your sightseeing early on the 25th (Thu) to allow enough time to drive to Salem. Salem is the capital of the U.S. Start off your visit on the 26th (Fri): make a trip to The Gordon House and then admire the sheer force of Silver Falls State Park. On your second day here, get in on the family fun at Enchanted Forest Theme Park, see the interesting displays at Evergreen Aviation & Space Museum, and then take in the architecture and atmosphere at St. Mary's Catholic Church. To see other places to visit, ratings, maps, and tourist information, refer to the Salem trip itinerary maker website . Traveling by car from Grand Canyon National Park to Salem takes 19.5 hours. You'll gain 1 hour traveling from Grand Canyon National Park to Salem due to the time zone difference. In July in Salem, expect temperatures between 86°F during the day and 56°F at night. Finish your sightseeing early on the 27th (Sat) to allow enough time to travel back home.